Yep, revival scheduled twice a year. This is the kind of church we were a part of when I was in high school. 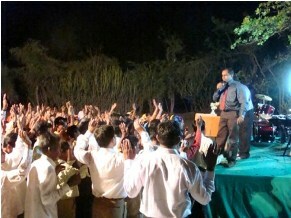 When we had a visiting Evangelist in about half of the congregation would go up to the front at the end of the service in response to the invitation. It seemed like no one responded to preaching by going to the front of the church except during those two weeks. The “revival” messages were on avoiding hell, witnessing more, staying pure before God, and dedicating your life to “full time Christian service.” It seems to me that whether you’re talking about charismatic sensationalism, decision oriented salvation, or whatever we keep trying to stir something up because we don’t much patience for waiting on God and asking Him why He’s silent. Paul, totally with you dude, been in that kind of church as well. I think all the stuff they preach about is great, but as was pointed out, revival is a reawakening, a making alive again. I did have a preacher who once said “You have to be ‘vived’ before you can be revived.” But, I do truly believe that the gospel should be a part of our lives, revival is really for the truly saved. 2 Chronicles 7:14.